The post Hot Spots on Dogs — Causes, Treatment and Prevention by Dr. Ernie Ward appeared first on Dogster. Copying over entire articles infringes on copyright laws. You may not be aware of it, but all of these articles were assigned, contracted and paid for, so they aren’t considered public domain. However, we appreciate that you like the article and would love it if you continued sharing just the first paragraph of an article, then linking out to the rest of the piece on Dogster.com. The rug in front of Robin’s door was a tangle of hair and blood; couch cushions strewn across the floor. Hearing faint echoes of whimpering from the kitchen, she rushed to find her beloved Boston Terrier frantically clawing at the side of her face. Robin swept Suki into her arms and sped to her veterinarian. Suki was suffering from one of the most dreaded dermatological conditions veterinarians confront: acute moist dermatitis or “hot spots.” What makes hot spots on dogs so devastating is the incessant, seemingly uncontrollable scratching, chewing, rubbing and nearly instantaneous mauling of the skin. Affected dogs seem to be unable to stop injuring themselves as they desperately seek relief from intense itching and burning. What’s at play when it comes to hot spots on dogs? Photography ©Christian Buch | Getty Images. Any skin irritation can lead to hot spots on dogs of any breed. Hot spots on dogs are more common in male adult dogs than females, and Collies, German Shepherd Dogs, Labs, Golden Retrievers and Rottweilers may be more predisposed to hot spots. 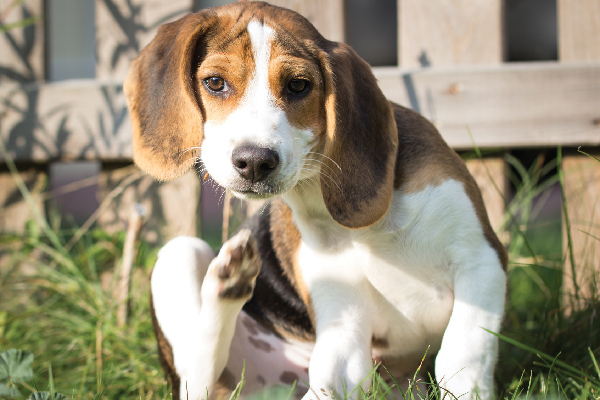 Biting insects such as fleas, ticks and mosquitoes top the list of causes, followed closely by skin sensitivities. Matted fur, dampness and lacerations can also trigger hot spots on dogs. Seasonal and food allergies commonly spark hot spots on dogs. Some dogs react severely to skin irritations and excessively lick and chew at the spot. Gnawing creates more inflammation, worsening the skin lesion until a large area is affected. Bacteria then infect the open wounds, further aggravating the condition. Hot spots on dogs can occur within a few minutes to hours and can spread rapidly if untreated. The first is to clean the infected area. The fur around the hot spot will get shaved and the skin disinfected. Hot spots on dogs can be intensely painful, and many dogs will need pain relief or sedation to treat. After cleaning, anti-inflammatory medications to ease the itching are often administered. These may be injectable drugs, oral or topical medications or a combination. Antibiotics are usually needed to combat secondary bacterial infections. Most regimens offer immediate alleviation and are given for one to two weeks. Severe cases or recurrent hot spots on dogs may require extended treatment or additional diagnostic tests. Appropriate flea and tick preventive usage, keeping hair clean and dry, grooming dogs with dense and thick coats and avoiding allergens in foods are essential elements of preventing hot spots on dogs. If your dog suffers seasonal allergies, administer medications and nutritional supplements before allergy season. Ask your veterinarian about adding omega-3 supplements, quercetin, black currant seed oil (BSO) or coconut oil to your dog’s skin-care program. While it’s impossible to prevent all hot spots on dogs from occurring, with a little foresight, planning and dedication, you can reduce your dog’s risk. Suki felt much better the following day. The redness and weeping had eased, along with her urge to scratch and rub her cheek and neck. Robin administered a calming salve to the wound, along with an antibiotic and supplements. Her veterinarian suspected an underlying allergy was to blame and prescribed an antihistamine to use during pollen season. Within 10 days, Suki’s fur was growing back, and the skin looked normal. At her two-week recheck exam, Suki’s veterinarian congratulated Robin on her excellent nursing care. Based on Robin’s schedule and Suki’s lifestyle and risks, they created a skin-care routine to help avoid future hot spots. Monthly flea and tick preventive, weekly medicated baths, and daily omega-3 added to Suki’s food formed the foundation of her plan. Three weeks before each pollen season, Suki would begin an antihistamine, and Robin would contact the hospital if the itching persisted or worsened. Robin left with a better understanding of why hot spots occurred and feeling comfortable she was doing her best to avoid the ambush of acute moist dermatitis, or hot spots on dogs.